The theme this week at I Heart Faces is from a distance. Usually when you submit a picture you must have a human face clearly visible, but with this theme it was a little different. As long as a person is somewhere in your photo you are good to go! This is Stanley Lake in Idaho. 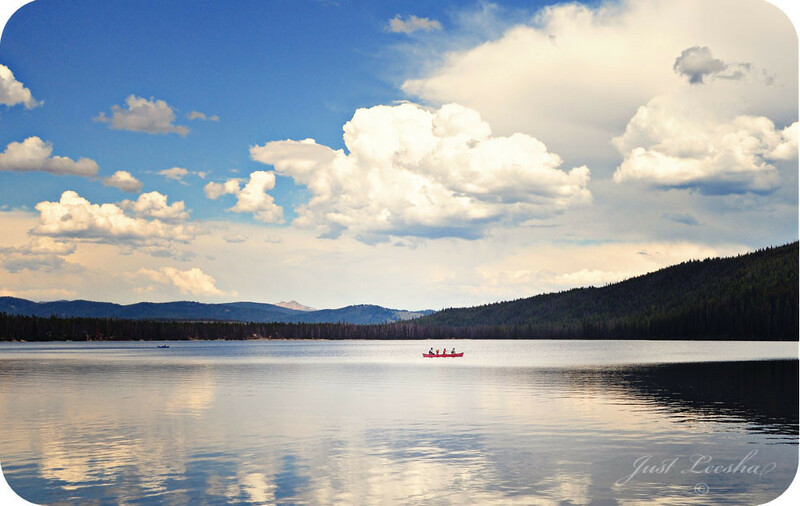 This particular camping trip was kid free for my husband and I…. (whoo hoo! ummm I mean….bummer! ), but we do hope to make at least one trip up there this summer with the girls. I have no doubt there are going to be some amazing from a distance shots this week! So feel free to par-ooze all the other entries by clicking on the link below. Awesome red canoe against the blue sky!! what beautiful scenery!!! love the contrast of the red canoe! What a beautiful lake. Absolutely gorgeous image. I adore it! What a gorgeous location! The pop of color in the distance really draws your eye in. Lovely! gorgeous! my fave so far. beautiful view- love this photo! aww – the clouds – stunning! I love it! That little bit of red is perfection. what magnificent clouds! Great photo! Wow!!! Oooo and ahhh is right, it looks so peaceful and relaxing!! I love landscape photography and whenever I am shooting near water, I can’t resist a great reflection shot.. this is beautiful! Wow! This is so beautiful!! gorgeous entry! it’s very distante, indeed! beautiful! perfect composition, what an eye you have. Gorgeous!!! Perfect day, perfect photo. LOVE this photo -its my favorite! I love this! I’m expecting to see it in the top ten, for sure. Leesha, your photos always amaze me!!! Wow – that is gorgeous!! Love the pop of colour from the canoe. Oh, gosh. That really is a fabulous image.